Colburn and Scott Outfitters had a fun hunt with hunting partners Rick Albrecht and Ed Howell. 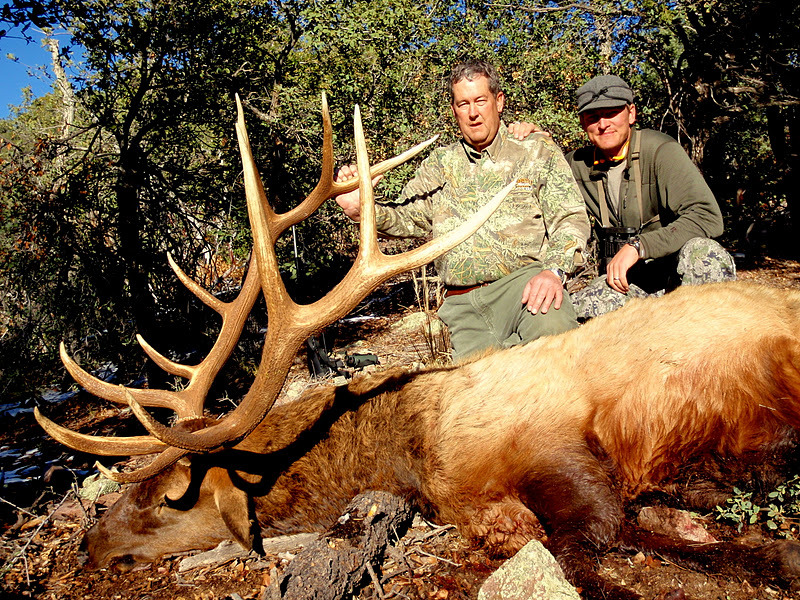 The packout on Ed's bull was definitely one to remember! 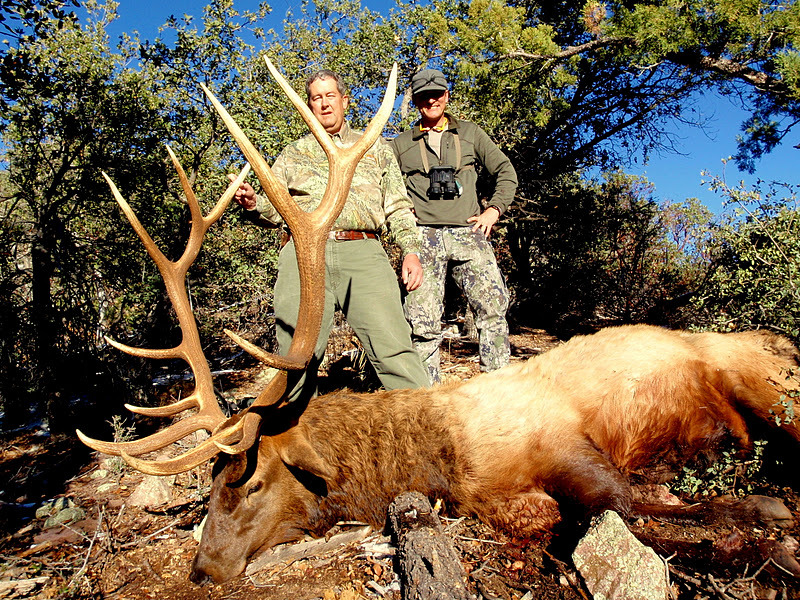 "I hunted with Colburn and Scott Outfitters for my Arizona Unit 23 Late Elk 2011. I arrived in Young, AZ the day before the season opener (Thanksgiving Day) what a surprise to find Darr Colburn preparing a turkey for the oven. Janis Putelis my guide arrived shortly after from his morning scout. After a great turkey dinner Janis took me scouting that evening we saw 4 bulls one that I decided to pass on. Darr’s client took this bull at 7:30 am opening morning (congratulation’s David). After Darr’s client killed I had both guy’s trying to find a bull for me (they are amazing with their optics). Our bad luck the weather was very warm and the elk went nocturnal but we still managed to find elk every day. Long story short I passed on some good bulls hoping for the monster, we looked on the map for anything with the name Devil in it thinking a monster would be living there. I killed my bull on the last day with a few hours left in the season, I am very happy with the bull I took knowing the effort Darr and Janis put into my hunt. I felt like I was hunting with friends and hope they feel the same. We named this elk the Devil’s Sphincter Bull. Thank You." Yesterday was opening morning of the late hunt. We had been scounting for about 5 days before the hunt started and had seen some nice bulls. I was hunting with David Combs and his wife Sona. Janis and his hunter Rick saw a couple of nice bulls the evening before the hunt started and gave us directions how to get there. David is 70 years young and is a very experienced hunter. David, Sona and I were waiting in the dark on the point where Janis and Rick told us to go. At first light I glassed up a bull bedded at 310 yards. 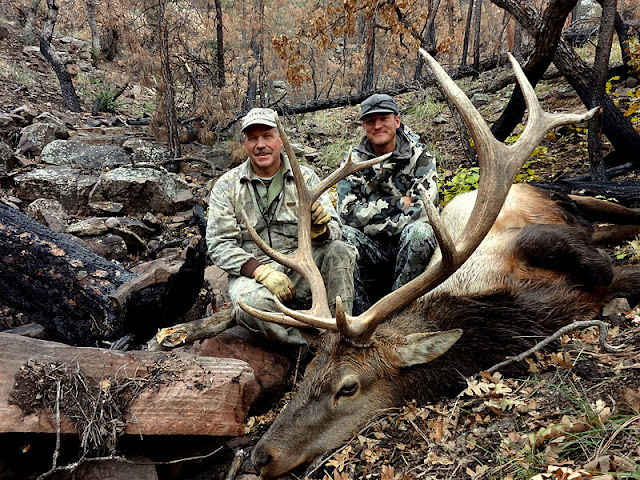 After 20 minutes of trying to get a rest David connected on a great late hunt bull. The bull has seven points on his right side and had seven on his left but broke a couple of points during the rut. When cutting up the meat for the pack out we found a 3 blade Rage broadhead and 4 inches of arrow in the bulls left shoulder. It took Janis, Rick and I most of the day the get the bull packed out. Here are a few pictures. David and Sona where great to hunt and share stories with. I look forward to spending more time with them again someday. I hope am still hunting when I am 70.